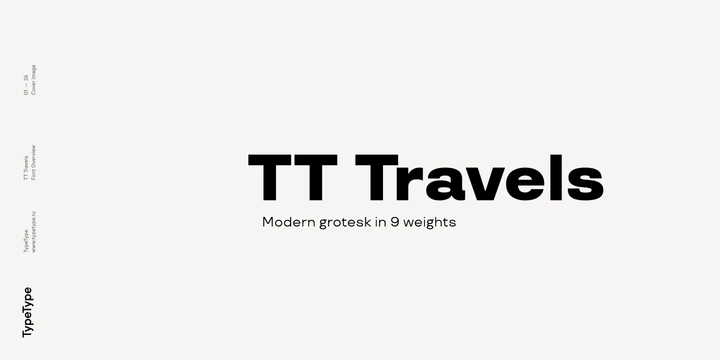 TT Travels is a sans serif typeface created by Vika Usmanova together with TypeType Team and published by TypeType which is available in 18 styles, 9 weights and italics, a wide range of OpenType features and multilingual support. This modern geometric grotesk font was wide proportions and a specific shape of circles. Depending on the fonts’ weight, some glyphs have different shapes. It is iadeal for advertising, branding, headline, magazine, poster, editorial use, web etc. Have fun! A font description published on Monday, December 11th, 2017 in Fonts, TypeType, Vika Usmanova by Alexandra that has 1,432 views.